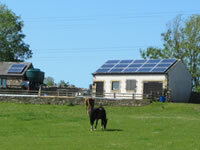 Having considered solar PV for a couple of years and looking into a DIY kit we found GEGUK excellent value for our 3KW system, which is raking in the electricity and cash as I write! 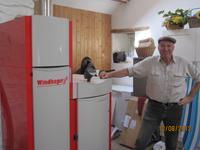 I received �470 in May and the next FITs are due Sept. A DIY 3KW kit was over �10,000 in 2010 at the time the electrician we asked had little idea what we were talking about (though I see he now installs panels himself) and other companies wanted between �14,000-17,000 for the same installation and despite claiming they didn�t use the hard sell method I'm afraid some got on my nerves that much I had to tell them they'd put me off! I liked Steve Gridley from the first phone conversation as soon as he said �I am an engineer not a salesman� I took to him! The installers were here in the afternoon measuring up for the scaffolding and they started the job the next week. They were very courteous efficient and friendly and cleaned up afterwards even the guttering and replaced everything as it was before the scaffolding was erected. I already recommend the company to people who show an interest and some people are surprised at the low cost having braced themselves for a shock! Since Green Energy Generation fitted my Solar PV and Solar Thermal cells, I have had virtually unlimited hot water and early indications are that my electricity bills will be considerably reduced. This is exactly what i was looking for, and what Green Energy quoted. Biomass in the form of wood pellets can be classed as "liquid wood", which has many of the properties of LPG and oil, such as high energy density, easy to transport, deliver, handle and meter, without the major drawbacks such as serious fire, explosion and pollution risk, as well as the obvious major attraction in being a fuel which provides heat from within our natural carbon cycle, without releasing the CO² from ancient sunlight trapped in a fossil fuel. With most emerging services potential customers can easily be overwhelmed by complex, longwinded and often misleading information. Solar Power is no exception, however our experience with Green Energy Generation Limited turned out to be far easier than expected. They confirmed all of our findings (from the WWW) and took our understanding of Solar Power Generation and how funding FITs (Feed In Tariffs) all fit together. Turning this knowledge into a long term commitment became a fairly straight forward decision backed by support of the team at Green Energy Generation. Making appointments, committing to contract and finally installing the system all turned out to be handled in the most professional manner we could wish for. The installation team, although quite young were very knowledgeable and organized. They were backed by a highly skilled scaffolding squad who were in and out in just a few hours. 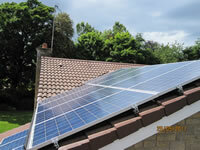 The complicated roofing system was handled without fuss with the 3.95kw system installed in just over the day. We are now some three months down the line of electricity generation and so far the predicted output is right on forecast. My thanks go to the whole team. David & Christine Fenwick, Stocksfield. From the initial meet, service was prompt, friendly and to the point, immediately carrying out a site survey to assess feasibility. There was an issue of shading; Green Energy Generation came several times to assess the impact of this. GEG took all relevant data (mostly from the roof top) at various times of the day to estimate the expected future generation. A comprehensive report was forwarded to me allowing me to assess the financial factors to make a decision to proceed or not. I believe the report was very honest, some other companies had underplayed the shading, others had not analyzed the impact of the shading at all. One other company had quoted for the installation without even visiting the site! At no time was there any pressure to close the deal. Working in a similar industry, i had many questions and some requests of some technical variances, such as the relocation of inverter and cable sizes. These were dealt with and accommodated by GEG with a friendly prompt and professional manner. I had some technical questions on the types of panels and some feelings on the reputations of different panel manufacturers. GEG listened to these, forwarded independent test reports, dimensions (for whether or not they would fit on my roof space) and costs. I believe GEG steered me in the right direct for panel choice. I had only a few dates for the installation, the first of which was for before Christmas - GEG accommodated this. Scaffolding arrived on time, was installed without any property damage, staff were very friendly. Unfortunately there was a heavy snowfall immediately after the scaffolding was erected. GEG arrived as planned, the roof was cleared but the roof panel installation was postponed due to the risk of further snowfall. The internal installation was started,. The following day conditions were re-assessed and the roof installation deemed safe; all panels were fitted in a professional and efficient manner despite bitterly cold conditions, around -5�C � this took around 1 and a half days. The installation was completed in 3 days start to finish despite arctic conditions. Green Energy Generation�s staff and contractors worked in and around my home (with kids and a dog) in the accustomed friendly and professional manner causing the least family disruption possible. Commissioning was carried out without delay following the installation. The whole installation was tested in accordance with the latest IEE regulations, finding an existing installation main earth was not to current standards. GEG replaced this with the minimum of fuss and without charge. The system was put into service, interlocks checked and relevant operation training given. All queries were answered. Test certificates, insurance guarantees and MCS certificate were all issued promptly. It was stressed to me on commission that if any fault occurred i could look in the manual but GEG would prefer and expect a phone call, thereby showing willingness to take responsibility of the system. A minor problem did come to light after commissioning (which did not compromise generation) Green Energy Generation came immediately (during the Christmas period) and rectified the problem. The whole project has been completed on time, on cost and to a very high standard. The staff and contractors were very professional and courteous at all times. The friendly relationship of GEG made questioning easy, replies were prompt, informative, and without any bias. I believe i now have an excellent solar PV generation system/ i would strongly recommend Green Energy Generation to future customers as a reliable professional solar PV company. Having dealt with some larger national solar companies it is obvious that Green Energy, still being a relatively small and local company, is out to make a reputation for themselves rather than just a quick sale. 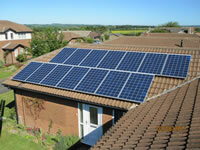 I rate my dealings with Green Energy Generation and the final PV system 10 out of 10. I would be happy for you to give my telephone number to new potential customers for a reference. After some initial research we obtained several quotations and were particularly impressed by Steve Gridley's obvious knowledge and enthusiasm on his initial visit. He arrived promptly, carried out a very thorough survey and without wasting any time on unnecessary waffle he satisfactorily answered and covered all of our questions. One or two questions we thought of later, were answered equally as promptly. We received a comprehensive and comparative quote, including two alternative configurations which we had requested for comparison. 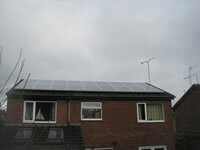 The system was then installed in October 2011 and the work by both the panel installers and electricians was professional, on time and very tidy. Since then it has been quietly and efficiently generating electricity as well as can be expected in short winter days. We were also pleased that the burden of form filling, arranging FIT payments and all other relevant documentation was efficiently handled by GEG on our behalf. Thank you all for a job well done. We would happily recommend GEG to anyone else and have indeed already done so. We found the service Green Energy Generation gave us, brilliant. There was no fuss or nonsense. Everyone did their bit, electricians, roofers and solar guys professionally and with good humour. After having spent 18 months renovating the house, it was refreshing to find workmen who totally cleaned up after themselves afterwards. 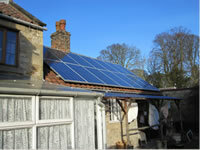 The paperwork was well done and forwarded to our energy supplier (EON) quickly and efficiently. The whole process was completely painless from our point of view and we would thoroughly recommend your company. Lynn & Mike McQuinn, Warkworth. What can I say that has not already been said? Steve/Green Energy simply did what they said they would do: "Fit a solar energy solar panel system that is the correct size and is generating the estimated energy." The installation team were experienced. Did the job with no fuss, and particularly pleasing cleaned up after they completed the installation. Steve leads from the front and runs a tight ship, and sets his teams high standards. He personally inspected the job after the installation was completed and has returned twice since to check its working correctly and to hand over the paperwork and explain how to get maximum use of the panels. Don�t forget yourselves in the office; to be successful as a company the office staffs are a vital cog in the machine. The communications from yourselves has been first class and I haven�t had to do a thing. This all rounded up makes me a very satisfied customer and I have and will continue to support Green Energy in any way I can. I wish you ALL continued success now and in the years to come. Very happy with the service so far and we're still providing Steve with information on our generation. Whoever comes out please ask them to bring some more of Steve's business cards so I can pass them on! Some Transition Tynedale members may be trying to make up theirminds on whether they can - or should - generate a fraction of their own electrical energy. What are the costs? What financial help is available? Is there trustworthy and impartial advice to be had? Do the various schemes on offer deliver what they promise? I took the plunge after almost a year of thinking about it and asking just such questions, with my husband sitting on the sympathetic but sceptical sidelines for much of that time: he wasn�t at first convinced but came off the fence after talking at length with the engineer who eventually installed the system we decided to buy. 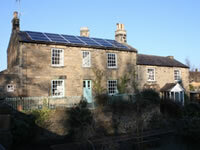 Our solar panels have been fitted on to the south-east-facing roof of our Hexham house - a property which, because of its location, is quite conspicuous. We're at the top of the bank that runs down to Cockshaw Burn just past the Fox pub heading west out of the town - and the panels have attracted a lot of attention. The photovoltaic cells - they produce electricity, not hot water - have the potential, in our installation, to generate 4 kilowatts of power that leaves the panels as direct-current (the sort that comes out of a car battery) and is turned into alternating current (the sort that comes from the Grid and what we use in most of our appliances) through an inverter, which is mounted inside the roof space. They have been generating energy for five months now: even though there were many dull and rainy days in the first couple of months, we've clocked up nearly 2000 kilowatt-hours of electrical power so far. When it's sunny or even light, the meter starts to register rising levels of generation until, in the middle of the morning, even on grey days, our old meter stops, turns backwards, and we begin to send electrical energy back into the Grid. We become, in effect, a little power station, able to draw off electricity for our own use and transmit the surplus back into the national supply network. And, as the days grow longer and the light levels rise, so will the effectiveness of our microgeneration system. Our cells are arranged in an array of 18 panels, landscaped across the roofline in 6 sets of 3. 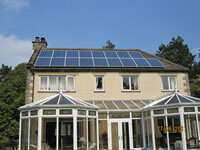 Since they follow the same shape as the roof, they are not as obtrusive as 'portrait' panels might have been, and we are glad that our installer (Steve Gridley of Green Energy Generation at http://www.greenenergygeneration.co.uk ) was willing to find panels that could be fitted in this way. Steve was good to work with, giving us genuinely useful advice along the way and bringing up issues we had not thought about ourselves. After his careful recce, the system was installed smoothly and speedily: the scaffolding went up on a Friday, the frames and panels were secured to the roof on the Monday and Tuesday, and the scaffolding came down on the Tuesday afternoon, by which time, we were already producing power. A year ago, the then Government finalised details of how to encourage homeowners to do what we have done. They announced a "Feed-in Tariff" - a rate of payment agreed with the electricity supply industry and Department of Energy for small amounts of electricity generated in this way. That's how our micro-system is now paying for itself. We SAVE money by not using quite so much power generated externally; we MAKE money by selling a little of our sun-power to a grateful Grid - but we are also paid a tariff for the entire amount of electricity the panels generate! 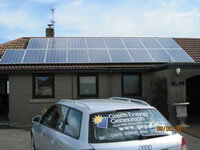 Just before the feed-in tariff began on 1 April 2010, I began to seek quotes for a suitable system. The capital cost was high - more than a new car would have been - but we realised that there was, in effect, a quantity discount: the more panels we purchased, the cheaper per panel; and the more kilowatt-hours we generate, the shorter the payback period. 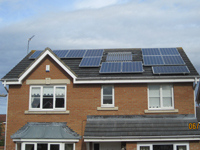 We estimate that our income from the feed-in tariff plus our reduced electricity bills means that we will have broken-even after 8 years, and the next 17 years of the guaranteed feed-in tariff will be 'pure profit'. I use those measures simply because the equipment itself is guaranteed for 25 years. We didn�t do this for profit of course. We wanted to play a part in decreasing our carbon footprint, and the feed-in tariffs made it economically feasible for us. We also have a fascination for the bio-mimicry of the photovoltaic technology: our PV cells basically imitate the process of nature's own photosynthesis. It's very exciting. And we're happy to have visitors stop by to ask questions, or give us a call at 609973. Here's to a long and sunny summer in 2011! Wendy & Ian Breach, Bridge House, Hexham. 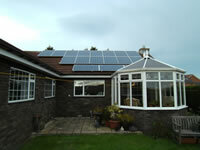 We are very happy with Green Energy Generation and have been recommending friends to you. I believe they have already been in touch, and I know one of them now has your panels on their roof. In a short summary, we are very pleased with your company's speedy response, wonderful and courteous service. I cannot speak highly enough of your company and would not hesitate recommending your company to anyone else. Registered address: Front Street, Bebside, Blyth, Northumberland, NE24 4HP. Website design & development by Beach Design.